via email…..Sick of gas prices going up? So are we. This song takes a satirical look at the situation before the time comes when we can’t afford our gasoline. How ’bout those hybrid cars, eh?”…..I came across this forward by email. You have to check out the lyrics below and all the animations in the video. You can see the animation and video here. Turn on the sound !! 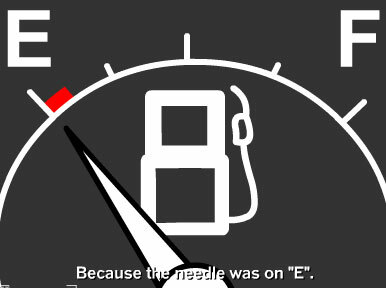 Because the needle was on “E”. I can’t afford my gasoline. They’re up 5 cents a day. Who has that kind of green? He can’t afford his gasoline. We can’t afford our gasoline. You’ll get screwed at the pump, so bring your vaseline. If you have trouble downloading the video, go here (2.2 MB) dowload. Million Dollar HomepageWhat’s it gonna be tonite ! !